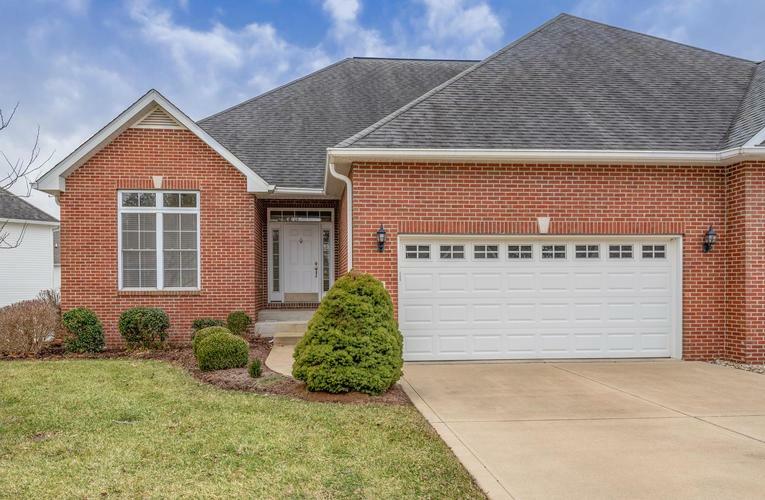 This beautiful garden home in Tamarron is conveniently located near Indiana University, the new IU Health Hospital and College Mall. This pristine home has an open great room with entertaining kitchen, built-ins, and large split bedroom formation. Abundant cabinetry and solid surface countertops enhance this kitchen with light cabinetry and extra storage. A dedicated laundry is located off of the kitchen and accessible to the two car garage. The luxury master suite has access to the deck system and a spacious dressing room area in the spa bath has double vanities, two large walk-in closets and lovely tile work. This extremely well-maintained home has two additional secondary bedrooms and an unfinished lower level with walkout and large south facing windows. This quality built home by G&S Homes has steel beam construction, has a stubbed in area in the lower level for an additional bathroom, and custom features throughout. This easy living condo has a prime lot on the green space with natural southern light that brightens the entire home. Enjoy this fantastic location near conveniences, bus line, and Bloomington’s cultural activities. Directions:East 10th St. to Tamarron, Straight to Callery Ct.